The purpose of this study was to examine hip abductor muscle activity and hip and knee joint kinematics during resisted side stepping in order to determine the level of muscle activation in both the stance and moving limbs and the effect of posture during this exercise. Previous studies investigated the maximum voluntary isometric contraction [MVIC] of various hip abduction exercises including resisted side stepping, sidelying hip abduction, as well as weight-bearing and non-weight bearing standing hip abduction. According to the authors, only two previous studies specifically measured gluteus medius and tensor fascia lata [TFL] muscle activation during resisted side stepping. Only one previous study examined resisted side stepping with patients maintaining an upright posture and only one other study examined resisted side stepping with patients in a squat posture. No previous study compared hip abduction activation in both the squat and upright postures. This study was unique because the researchers compared muscle activation of the TFL and gluteus medius during resisted side stepping in both the upright and squat postures. The participants for this study included 24 healthy, college aged adults (12 male,12 female, mean +/- SD age, 22.9 +/- 2.9 years; height 171.1 +/-10.5 cm; mass 68.6 +/- 12.9 kg) who reported having no back, hip, knee, or ankle pain of greater than 2 weeks within the previous year. Muscle activity of the TFL and gluteus medius in the stance and moving limbs were measured using a surface EMG system. Three-dimensional knee and hip kinematics were recorded using a 10 camera motion capture system and quantified using the commercially available software.). Participants of this study stood with each foot aligned with the sides of a 12-inch (approximately 30 cm) wide square floor tile. A resistive elastic band was wrapped around the participant’s ankles and tied so that it was gently stretched to approximately 110% of its full, unstretched length. Then, participants were instructed to side step a distance of 1 floor tile (12 inches [30 cm]) resulting in the feet being approximately 60 cm apart. Then participants moved the other foot so that the feet were once again approximately 30 cm apart. After side stepping approximately 8 steps, the participant was then asked to step in the opposite direction, eventually stopping at the location at which they started. This procedure was performed in both the upright and squat postures. 1. Muscle activity was greater on the stance limb than in the moving limb in both the upright stance and squat postures during resisted side stepping. This increased activity may be due to the fact that the stance limb has to produce sufficient torque to stabilize the pelvis against gravity. 2. 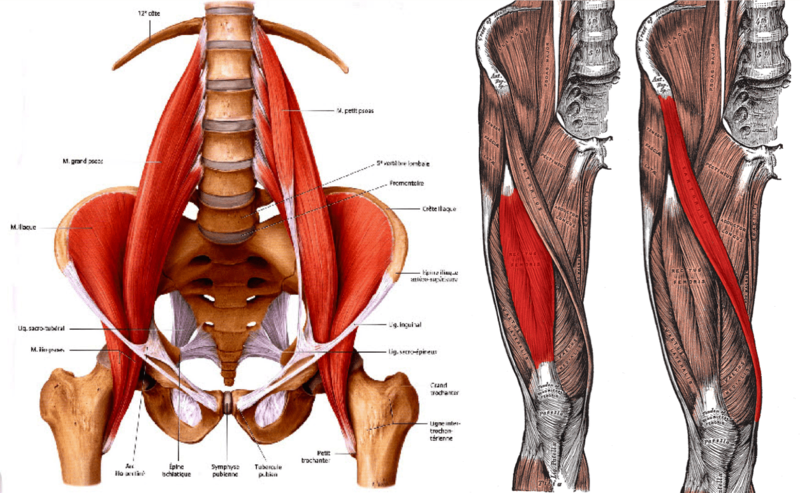 Muscle activity of the TFL was less during squat posture compared to upright posture whereas the activity of the gluteal muscles was greater in the squat posture compared to upright posture. In upright stance, the TFL functions as an abductor and also functions as a hip flexor to counterbalance the action of the gluteals. This counterbalancing prevents the pelvis from posteriorly rotating. However, the hip flexion moment caused by gravity in the squat posture decreases the need for the TFL to function as a hip flexor, resulting in decreased TFL activation. 3. Hip abduction excursion was greater in the stance hip compared to the hip excursion of the opposite hip. Although not a primary finding, the researchers also noted that the level of muscle activity measured in this study was more consistent with the level recommended for endurance training or neuromuscular re-education as opposed to strengthening. One explanation may be due to intentionally keeping the resistance of the elastic band low to prevent muscle fatigue over multiple trials. There were some limitations of this study and are important to note. One limitation was that a sample of convenience composed only of healthy, asymptomatic individuals was used and may not accurately portray the population. As mentioned previously, the resistance was also kept low. Also, muscle activity was only measured during the concentric phase and was only measured at a single location on each muscle. Therefore, these measurements may not accurately reflect the actual level of muscle activation. In conclusion, this study may help guide clinicians in exercise prescription for hip abduction weakness. 1. If the clinician primarily wants to focus on the gluteals and simultaneously decrease the activation of the TFL, they may opt to utilize the resisted side stepping exercise in the squat posture as instead of the upright posture. 2. Also, the clinician should recognize the fact that there is greater gluteal muscle activation on the stance limb as opposed to the moving limb during resisted side stepping in both postures. 3. For patients with hip abduction limitations, it is important to note that there was greater hip abduction excursion of the stance limb compared to the moving limb. There are many different hip abduction exercises to choose from when creating a home exercise program or therapeutic exercise prescription. This article is helpful in providing insight into how resisted side stepping can assist patients in gaining endurance for weak hip abductors. Hip abduction weakness affects a substantial population of patients including those with hip osteoarthritis, total hip arthroplasty, weakness following CVAs and many more. With increased hip abduction weakness, the TFL may compensate to assist with hip abduction. After reading this article, I may choose to have my patients assume a squat posture during resisted side stepping to decrease TFL muscle activation and target the gluteus medius. Also, I believe resisted side stepping is more functional than those exercises performed in recumbent positions. During side stepping, the most gluteal activation occurs on the stance limb to stabilize the pelvis as the other limb is moving and is important because the gluteals must also stabilize the pelvis in normal gait. There are a plethora of functional testing options and subsequent exercise prescriptions at a clinician’s disposal. It is often difficult to know where to start or how to organize such tools. The IAOM SenMoCOR classes provide a systematic approach to assessing functional movement patterns with recommendations for exercise based on findings; by using this method the clinician can be confident in providing a truly individualized exercise plan for their patients for optimal outcomes.